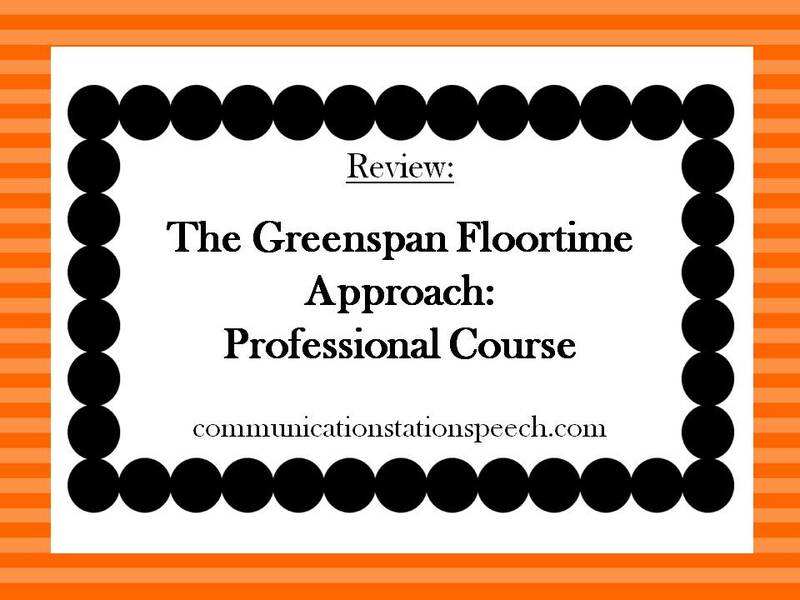 The Greenspan Floortime Approach: Professional Course! It’s Tip Tuesday and today I would like to talk to you about an amazing opportunity I had over the summer to participate in an 11 hour professional development course on The Greenspan Floortime Approach. As you may know, Dr. Stanley Greenspan developed the DIR/Floortime approach. And although DIR has been observed to be a positive approach to learning for persons with ASD, this particular approach is NOT exclusive to ASD but rather was developed as a means to to work with persons diagnosed with any disability or medical diagnosis (which may be one of the reasons I enjoy this therapeutic model so much). His therapeutic approach is relationship based, developmental in nature, and inclusive of a person’s individual differences (i.e. auditory processing disorder, sensory integration disorder, apraxia, etc.) as well as family/cultural considerations. Dr. Greenspan, along with his colleagues, studied child development and determined that typical development is demonstrated via 9 possible FEDCs (Functional Emotional Developmental Capacities). The FEDCs (also referred to and possibly more well known as FDLs-functional emotional developmental levels) begin in infancy and continue to develop throughout our lifetime. Once we understand social relationships and cognitive development in terms of FDLs, it is believed we can facilitate a child’s growth and development through additional FDLs yet to be mastered. As this post is really to discuss the professional development course I completed rather than the actual FDLs I will not go into much detail here, but you can find all of this information by taking the professional course here. There are so many positives to participating in this course, however I will list for you the things I liked the BEST. 1. Authentic videos: Although, I have not had the privilege to see Dr. Greenspan speak in person prior to his passing, I was pleasantly surprised to see that included in this course were hours of authentic video from his presentations. Even though the video was grainy at times, I don’t think anyone could explain DIR with the same passion and knowledge as Dr. Greenspan himself. I very much treasured watching these videos during this course. 2. Self-paced course: I also enjoyed that this online course is a self-paced course in which participants are given 90 days to complete. Being a mom, wife, therapist, and owner of my own practice, along with my added blogging journey, time is a commodity I do not always possess. So completing this course in a time frame that worked from me was extremely helpful. 3. Repeating lectures: During the 90 day period, I was able to view the lectures as many times as I wished. This was so great for the times I was often interrupted by my rambunctious 3 year old. 4. Handouts: Each lecture comes with handouts that I was able to print ahead of time and use to take notes while I watched the lectures. 5. Evaluation/Test: The test at the end of the course was quite comprehensive and although daunting with 80+ questions, I felt confident in my professional knowledge and understanding of the Greenspan Floortime Approach after passing with flying colors. What happens if you don’t pass the first time? Don’t you worry!!! You do get an additional opportunity to re-take the test! 6. CEUs: You can earn 11 ASHA approved CEUs for this course for the total cost of $175 (that’s only $15.09 per HOUR of CEUs!!!!). You could potentially (depending on your state’s requirements) use this course to meet your yearly license renewal requirements as well! Kill two birds with one stone? I’ll take it! 7. Parent Course offered: This website also offers a parent course (6 hrs) to demonstrate to parents how can implement techniques of the Greenspan Floortime approach at home! This is AN AMAZING opportunity for parents AND professionals alike!!!! How wonderful to have a source of such amazing information! For more information click here! Taking this course for me was a wonderful opportunity and an eye-opening experience. I learned to see not just delays in the sense of speech or language, but delays in the underlying relationship skills required to facilitate communication development. I learned “where to begin” when working with individuals with severe-profound delays and how to transition my clients from one stage of social development to the next with the use of FDLs as my guide! I encourage any parent or professional (educators, therapists, etc.) who has or works with children with special needs to check into the Greenspan Floortime Approach courses. I’m so glad I was given this opportunity to learn from the master himself!!!! Book Review: Learning to Read is a Ball! ← Communication Station is on Twitter!